Almost five years ago as the parties fought it out in the Assembly election, the UUP, SDLP and TUV attempted to convince voters that the DUP and Sinn Fein were inextricably linked. The tactic failed, with both major parties increasing their number of MLAs, and Peter Robinson later said that he was relaxed about the smaller parties’ tactic because he believed that voters wanted to see Martin McGuinness and himself working amicably. Just five months out from an Assembly election, there are striking indications that the DUP and Sinn Fein may be returning to that sort of common purpose, in an abandonment of the largely fractious way in which they have done business over the last five years. 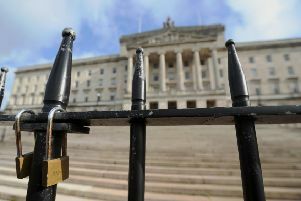 The ‘Fresh Start’ deal agreed between the two parties in November now seems to be more than a mere agreement about issues such as welfare reform and the number of Stormont departments. Rather, it increasingly appears to be a form of rebranding for the two big parties as they prepare for the electorate to pass verdict on their rule. Perhaps concerned that the smaller parties – and particularly those parties outside the Executive – could benefit from offering a ‘fresh start’ to the years of dysfunctional government at Stormont, the two big parties have seized the initiative and boldly claimed that it is they who offer the new beginning. It was striking that in her new year message new DUP leader Arlene Foster said “this New Year gives an opportunity for a fresh start”, while in his Mr McGuinness said that 2016 “offers hope of a fresh start for everyone across Ireland”. But making such a pledge is easier than following through on it. In 2011, Peter Robinson told the DUP conference that his party had been given a mandate to work with the other parties and proclaimed: “This is a new era in Northern Ireland politics”. Society, the First Minister said, was “ready to move forward”. Since then the Executive has gone backwards as it stumbled from crisis to crisis, and at points Stormont itself was in danger of collapse. The widespread dismay at Stormont’s performance is such that in August the nationalist Irish News suggested that a brief return to British direct rule could improve the standard of governance in the Province. Now it seems that the two big parties are preparing to move closer in an attempt to create a more coherent and responsive Executive. Although few unionist politicians are likely to come out and say that they trust Mr McGuinness, he appeared to have been a fairly reliable partner for the DUP up until disputes about welfare and the Maze peace centre eroded the sort of personal trust necessary in any relationship. But although the interests of the DUP and Sinn Fein overlap when it comes to making the Executive work (and reaping the electoral rewards for overseeing a popular government), they are parties which constitutionally, economically and socially pull in opposite directions. And although there is a risk for both sides in being seen to become too close, there is a particular risk for Mrs Foster. The continued existence of an armed IRA which appears willing to kill in certain situations means that being too closely shackled to Mr McGuinness could be catastrophically more damaging for her than it was for her predecessors in an era where the IRA was said to be winding up its operations after handing over its arsenal.